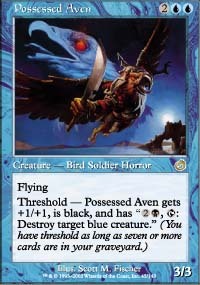 Threshold - Possessed Aven gets +1/+1, is black, and has "2B, Tap: Destroy target blue creature"
open. Probably a 4 in Limited. Gerhardt This is one of the 4 "Possessed" creatures in the set. All of them are similar, and in my opinion, they are all good. First of all, a 3/3 Flier for 4 mana isn't bad to begin with. Add in threshold, and you have an awful nasty dude who also has fun slaughtering blue creatures. I must admit, I question it's usability in constructed. Blue has never really been about horrendous beatdown, and Aven is not a beatdown creature. 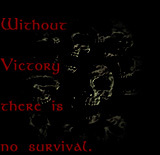 Plus, there are not that many blue creatures to slaughter. Maybe good out of a board. Does kill Finkel, though, which is a plus. In limited, it's a 3/3 flier for 4. It doesn't need other abilities, but it does have it. Basically a must play in blue. Extraordinary there. Turpish The threshold ability isn't nearly as important on this card as it is on most. Basically I see it as a 4/4 that's sometimes a 3/3 flier for FOUR, and it has an ability which may be of some use sometimes. FOUR! The price is right. Actually, for type 2, the price is unbelievably great. FOUR! Rares usually either totally rock in Limited or are puke horrible. Possessed Aven falls into the better end of this spectrum - 3/3 fliers tend to rock the house. Also, the fact that with threshold he becomes basically unkillable by normal means, AND gets a very nice added ability - well, this guy becomes a superstar. As for constructed... *yawn*. Another rare you'll be happy to win the draft with, yet won't pick in the rare split afterwards.